WASHINGTON — The day after the election in 2016, Nancy Goldstein, a 55-year-old Brooklyn writer and academic who has never been to Israel, opened up her computer and began the process of applying for Israeli citizenship. In Washington, D.C., 49-year-old entrepreneur David Bennahum began the complex process of moving his family and startup business to Montreal, finally establishing all four of them and the company there in July. The one thing they had in common: They are both Jewish. And both had looked at the campaign of Donald J. Trump and decided they would be safer as Jews and as liberals if they had an exit strategy from America. The question of living as a Jew in America under Trump has provoked varying degrees of anxiety in the year since he tweeted out an anti-Semitic meme about Hillary Clinton — the infamous Star of David tweet — and then sought to defend it as a “Sheriff’s Star.” That’s when I first started to hear the half-panicked, half-joking conversations about exit strategies if Trump won and considerations about where to go if America were ever to become unsafe. A friend whose grandparents had fled Germany talked to her mother about going back there. A half-Jewish, half-Australian friend decided to pursue — and ultimately secured — dual citizenship and an Australian passport. Contemplating worst-case scenarios is something practically encoded in the Jewish DNA, a legacy of 2,000 years of persecution culminating in the slaughter of 6 million Jews in the Holocaust less than a century ago. And given that most American Jews are Democrats and political progressives, the sense of foreboding that Trump has provoked has been compounded by his actions and rhetoric against other groups Jews have stood in solidarity with in America: refugees, immigrants, religious minorities, people fighting for civil rights. Now the events in Charlottesville, Va., have triggered more difficult historical memories, and forced some Jews to freshly confront troubling questions about their personal and community safety. And it’s forcing many of them to weigh how much they trust America against how much they trust their own fears about where their country is going under Trump. “What happened last Shabbat was terrifying. Seeing Nazis marching with torches on American soil touches our deepest vulnerability, our collective trauma. Hearing the leader of our country refuse to take a stand against them reminds us of so many closed borders, so many who turned away when our parents and grandparents were running for their lives,” Rabbi Rachel Timoner of Congregation Beth Elohim wrote in a letter to her Brooklyn, N.Y., congregation urging them to not feel alone in their fears, and to stand with in the wake of the Charlottesville car attack. Three days after Charlottesville, Eran Greenberg, a 42-year-old doctor who works in Northern Virginia, had a different response: He retook possession of the gun he’d bought years ago but kept stored outside his home. “Seeing this up three blocks from my house set me off,” he said, sharing a photo of an Identity Evropa poster proclaiming “Our destiny is ours” on a lamppost in Old Town, Alexandria, Va. Identity Evropa is an American white supremacist group, and the offices of “alt-right” leader Richard Spencer are in Alexandria, making the city a hub of white nationalist activity. “Every Jewish person I know feels pretty much exactly the same way. And it’s this sort of sense of dread because we don’t know when we’re being unnecessarily frightened and when to take it seriously. It’s the question that’s been asked by Jews around the world: When is it time to go? When is it time to leave? And when is it too late?” asked Kaili Joy Gray, 39, a D.C.-based senior editor at Share Blue media, who unspooled a Twitter thread asking similar questions after Charlottesville. “Most of the time for American Jews, now, in 2017, we feel pretty safe. We don’t necessarily stand out. We don’t necessarily get a lot of attention, and we are used to thinking about the horrible things that have happened throughout our history as historical things. And in the last few days we’ve seen Nazis, saluting Trump and saying ‘Heil Trump’ and it stirs anger and frustration and fear and makes you realize it’s not history, it’s right now and this movement — this hatred — is being fueled by the president of the United States and that’s terrifying,” she said. D.C.-area residents, like New Yorkers, have since Sept. 11 been urged to develop evacuation plans in the event of a terrorist attack, and many work in offices that continue to hand out emergency kits with items such as whistles and face masks. The fact that so many Jews live in communities that have already been on high alert or targeted by al-Qaeda doubtless contributes to the conversations about exit strategies and escape routes, along with the political environment and recent worries about a conflict with a nuclear North Korea. But mainly it’s Trump. “My husband and I have talked about [having to leave] only since Trump took office. In the last half-year, we’ve said, you know it’s a possibility,” said Maia, 40, a business development specialist in Washington, D.C., who asked that I not to use her last name or place of employment. “Thank God there’s an Israel and we have property there,” she added, noting that that would be the couple’s destination if they ever felt truly threatened in America. Israel, of course, routinely comes under rocket fire from armed militias and has been subjected to waves of terrorist attacks that dwarf anything seen in America. Bennahum’s reasons for moving to Canada were more complex than just the attentiveness to politics that comes with being a son of a Jew who survived World War II in Nazi-occupied Romania. There were serious business incentives, such as not having to pay healthcare costs for his employees, thanks to Canada’s single-payer system. And he speaks French. “What opened the deal was the election and then what closed it was the incentives offered by the federal government and the Quebec government to companies like mine to relocate engineers and resources,” he said. But he also has a dark theory about what’s happening in America, where he sees a democracy that has been under assault since the 1994 Gingrich revolution. The “deeply bad” Bush v. Gore decision, the “nihilistic Republican Congress from 2010 forward,” and Clinton’s loss of the White House despite winning the popular vote are, along with Gingrich’s move to polarize Congress, “four sequential fundamental battering rams to the social norms of the republic” that have helped weaken the American project, he said. “I think everyone needs an exit strategy. It doesn’t mean you have to exit right away. But if you have not executed on your path out, you’re naive. If your plan is just to wait and see, that’s not a good story. We know how that ends. That ends in tears, at best,” he said. Not everyone is so apocalyptic about the future for Jews in America. Fighting anti-Semitism is hard, and some of the most obvious approaches, such as taking down Twitter and Facebook accounts of white supremacists, don’t do as much to solve the problem as people might hope. What works best, what is most powerful, Forman said, is the power of social opprobrium. The Jews I’ve spoken with are less afraid that the U.S. government will turn on them with the organized ferocity of the Third Reich than that independent armed bands of anti-Semites and white supremacists will gain enough strength and engage in enough acts of terrorism, harassment and negative propaganda to bring what has been the golden age of America for Jews to an end. Fear of civilian anti-Semitism and mob violence, and not just official state actions, is deeply grounded in the Jewish experience of non-state actors being the vanguard of anti-Semitic violence when egged on by government officials. “Those Charlottesville marchers are a danger to us all. And I cannot simply write them off as a small band of loonies, not with the president giving them succor,” he said. And then there is the deep pain caused by watching elders taking note of the new anti-Semitism in their waning days. “When the Nazis invaded [my grandmother’s] hometown of Lodz, Poland, she was 18 years old. She watched as her parents and all the members of her family were killed. She survived three years in the Lodz Ghetto and internment in Auschwitz, Hainichen and Theresienstadt concentration camps,” said Soloway. Children too have been frightened in a way that hurts. “Yesterday my 9 year-old saw some footage from Charlottesville. Then she asked me if there would be a second Holocaust,” tweeted writer Peter Beinart on Friday. Some scoff at the idea that Americans would ever turn against Jews in a threatening way. Jewish Americans are, by and large, well assimilated, educated and successful. Trump’s own daughter Ivanka converted to Judaism when she married Jared Kushner, one of the president’s most trusted advisers. The public views Jews more warmly than any other religious faith, according to a Pew Research Center study from 2014, although the numbers are higher among older Americans than those under 30. As well, “Jews receive their most positive ratings from whites,” according to Pew, demonstrating that there is a deep well of good faith toward Jews among the population from which white supremacists seek to recruit. The widespread public condemnations of the marchers in Charlottesville and the rejection of the president by business, arts and charity leaders since his widely panned remarks Tuesday has been heartening to opponents of white nationalism. 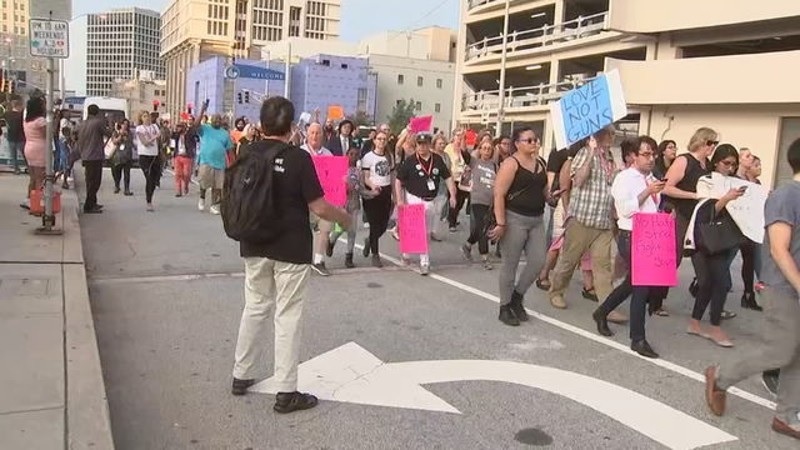 In Boston on Saturday, thousands of anti-white-supremacy marchers — the official police estimate was 40,000 — turned out to counter a “Free Speech” rally by Trump supporters and white supremacists that drew fewer than 100 attendees. But fear is visceral, not rational. “Rationally, the reaction to Charlottesville by everyone in America who isn’t Trump is reassuring — it suggests there is no significant constituency for anti-Semitism in America. Irrationally, I’ve been thinking about the mechanics of leaving the country and even of last-ditch resistance, ever since last November,” said Adam Kirsch, a poet and literary critic in New York City. Jews make up only 2.2 percent of the U.S. population, so even if only a tiny minority of white Christians choose to agitate against them, it could be felt profoundly given the broader demographics of the country. The Ku Klux Klan at its peak in the 1920s had a membership that constituted roughly 4 percent of Americans and was able to wield terror against African-Americans throughout the South. The increasingly bitter polarization of U.S. politics is also a troublesome turn for Jews, in that they overwhelming vote for only one political party: The Democrats, now out of power at every level of national government. Of all the measured religions, Jews voted for Clinton at the highest percent, casting nearly three-quarters of their ballots for her and 24 percent for Trump, according to Pew . By comparison, only 16 percent of white, born-again Evangelical Christians voted for Clinton. “The Jewish community has learned to live with the fact that one of the parties nominated — and White House came to be inhabited by — someone whose most fervent supporters are white nationalists racists and anti-Semites and those are the supporters he takes care not to alienate,” said Yehudah Mirsky, associate professor of the practice of Near Eastern and Judaic Studies at Brandeis University in Boston. “Frankly one reason we don’t have that in America, is that as far as I can tell American Muslims are not anti-Semites,” he added. Indeed Benjamin Sax, 42, a scholar at the Institute for Islamic, Christian, and Jewish Studies in Maryland, said his group has found that Jews, with their refugee experiences, and Muslims, currently fighting Trump’s ban on refugees and Muslims, have been coming together since the election to build bridges around opposition to the president. Rather than fueling anti-Semitism, he sees Muslims in America making common cause with Jews. “I live in Baltimore so I don’t feel at all under siege,” says Sax, but he too has felt compelled to consider over the past year to consider where he would go if he couldn’t stay in America. “I wouldn’t move to Israel, I lived there for five years. I thought about Germany. And I know that there’s a strange irony in that, but my wife grew up in Europe.” Denmark, which they visited on a recent trip, also looked attractive. “It’s very easy to get swept away in a European culture and ignore the demons that are in their closets,” though, he noted. There is also the option that many Jews are taking for now, to stay and fight. Build the self-styled resistance movement. Protest, organize and trust in America. “As the white Jewish mother of a black teen, I deal with my ‘Jewish anxiety and safety concerns’ by teaching marshaling for demonstrations and nonviolent civil disobedience and by helping to organize fierce, disruptive but peaceful protests of varying sizes. Building resistant, defiant, loud community is my jam,” Alexis Danzig, a member of the anti-Trump group Rise and Resist said, quoting from my query. Seven months into Trump’s first term, Goldstein has completed all the paperwork and been approved for Israeli citizenship upon completing one week of residency there, but it’s a step so fraught, she is still hesitant to take it. The president’s reaction to Charlottesville wasn’t a wake-up call for her but an example of what she feared and expected from his presidency. What she really wants, though, is to feel safe here again, not to leave America.